The department is responsible for the administration and collection of direct taxes including Income Tax, Corporation Tax, Capital Gains Tax (CGT) and Inheritance Tax (IHT), indirect taxes including Value Added Tax (VAT), excise duties and Stamp Duty Land Tax (SDLT), and environmental taxes such as Air Passenger Duty and the Climate Change Levy. Other aspects of the department's responsibilities include National Insurance Contributions (NIC), the distribution of Child Benefit and some other forms of state support including the Child Trust Fund, payments of Tax Credits, enforcement of the National Minimum Wage, administering anti-money laundering registrations for Money Service Businesses and collection and publication of the trade-in-goods statistics. Responsibility for the protection of the UK's borders passed to the UK Border Agency within the Home Office on 1 April 2008 and then to UK Border Force and the National Crime Agency in 2013. HMRC is a law enforcement agency which has a strong cadre of Criminal Investigators (c. 2000) responsible for investigating Serious Organised Fiscal Crime. This includes all of the previous HMCE criminal work (other than drug trafficking but used to include this up until 2008) such as tobacco, alcohol, and oils smuggling. They have aligned their previous Customs and Excise powers to tackle previous Inland Revenue criminal offences. They are responsible for seizing (or preventing the loss of) billions of stolen pounds of HMG's revenue. Their skills and resources include the full range of intrusive and covert surveillance and they are a senior partner in the Organised Crime Partnership Board. HMRC criminal investigation officers have wide-ranging powers of arrest, entry, search and detention. The main power is to detain anyone who has committed, or whom the officer has reasonable grounds to suspect has committed, any offence under the Customs and Excise Acts as well as related fraud offences. On 30 June 2006, under the authority of the new Labour Home Secretary, John Reid, extensive new powers were given to HMRC. Under Chairman Sir David Varney, a new Criminal Taxes Unit of senior tax investigators was created to target suspected fraudsters and criminal gangs. To disrupt and clamp down on criminal activity. This HMRC/CTU would pursue suspects in the same way the US Internal Revenue Service caught out Al Capone on tax evasion. These new powers included the ability to impose penalties without needing to prove the guilt of suspected criminals; extra powers to use sophisticated surveillance techniques, and for the first time, to have the same ability as Customs Officers to monitor suspects and arrest them. On 19 July 2006, the Executive Chairman of HMRC, Sir David Varney resigned. HMRC deals with the top 2,000 large business via CRM (Customer Relationship Managers). The next 8,400 business are dealt with via Customer Co-ordinators who provide a single point of contact with HMRC. In 2012 Revenue Scotland was formed and on 1 April 2015 it took HMRC responsibility to collect devolved taxes in Scotland. In 2015 Welsh Revenue Authority was formed and on 1 April 2018 it took HMRC responsibility to collect devolved taxes in Wales. On 12 November 2015 HMRC proposed to replace local offices with 13 regional centres by 2027. The Treasury Minister responsible for HMRC is the Financial Secretary to the Treasury, Mel Stride MP. See: Her Majesty's Civil Service#Grading schemes, for details. HMRC collected £557 billion for the Treasury in 2016/17. 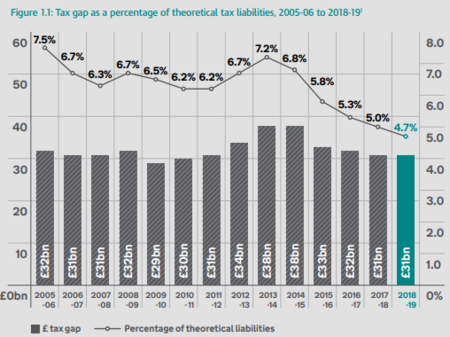 It estimated that total theoretical tax liabilities in that year were £590 billion, but £33 billion was not collected due to the "tax gap", made up of money lost to tax evasion, tax avoidance, error and unpaid tax debts. This equates to a collection rate of 94.3% (up from 92.7 in 2005-6). At the end of March 2009, HMRC was managing 20 million 'open' cases (where the department’s systems identify discrepancies in taxpayer records or are unable to match a return to a record) which could affect around 4.5 million individuals who may have overpaid in total some £1.6 billion of tax and a further 1.5 million individuals who may have underpaid in total some £400 million of tax. On 20 November 2007 the Chancellor of the Exchequer, Alistair Darling, announced that two discs that held the personal details of all families in the United Kingdom claiming child benefit had gone missing. This is thought to affect approximately 25 million individuals and 7.5 million families in the UK. The missing discs include personal details such as name, date of birth, National Insurance number, and bank details. The then Chancellor, stated that there was no indication that the details had fallen into criminal hands; however, he urged people to monitor their bank accounts. In February 2010, HMRC encountered problems following the implementation of their taxes modernisation program called Modernising Pay-as-you-Earn Processes for Customers (MPPC). The IT system was launched in June 2009 and its first real test came in a period known as annual coding. Annual coding issues certain codes to tax payers on a yearly basis. The annual coding process sent out incorrect tax coding notices to some taxpayers and their employers meaning that they would pay too much tax the following year. It was claimed[by whom?] that HMRC knew the errors were going to occur as early as June 2009. In September 2015, a report from Citizens Advice highlighted frustration amongst callers to HMRC over long holding times. The report claimed that "thousands" of callers were waiting on average 47 minutes to have their call answered, often at considerable expense to the caller. HMRC alleged that the "unscientific and out-of-date survey of tweets" did "not represent the real picture" but said that 3000 extra staff had been taken on to respond to calls. A June 2015 report from the National Audit Office indicated that the total number of calls answered by HMRC fell from 79% in 2013–14, to 72.5% in 2014–15, however a subsequent report in May 2016 suggested that performance improved following the recruitment drive. ^ "Her Majesty's Revenue and Customs". Commissioners for Revenue and Customs Act 2005. legislation.gov.uk. Retrieved 5 August 2012. ^ "HM Revenue and Customs: About Us". Hmrc.gov.uk. 18 April 2005. Retrieved 21 June 2009. ^ BERR Summary: ONS – UK Company Statistics Reconciliation Project (PDF). Department for Business, Enterprise and Regulatory Reform. January 2009. Archived from the original (PDF) on 26 February 2012. ^ "Introduction to the Money Laundering Regulations". HMRC. Retrieved 29 January 2012. ^ "HM Revenue & Customs uktradeinfo – Home". Uktradeinfo.com. Retrieved 27 February 2012. ^ "Section 138, Customs and Excise Management Act 1979 (c. 2)". Opsi.gov.uk. Retrieved 21 June 2009. ^ Criminal taxes hit squad aims to give fraudsters the Al Capone treatment. The Guardian. Philip Inman. 30 June 2006. ^ Revenue Chief who oversaw tax credit debacle steps down. The Guardian. Larry Elliot. 20 July 2006. ^ a b "Explanatory note on HMRC salaries and organisation charts" (PDF). .gov.uk. Retrieved 19 May 2014. ^ a b c "HMRC organisation chart: March 2014" (PDF). .gov.uk. Archived from the original (PDF) on 20 May 2014. Retrieved 19 May 2014. ^ "About the customer relationship management model". hmrc.gov.uk. Retrieved 9 April 2014. ^ "HM Revenue & Customs:Transforming HMRC – The Regional Review Programme". Hmrc.gov.uk. Archived from the original on 3 July 2009. Retrieved 21 June 2009. ^ "HM Revenue & Customs announces consultation programme on the way forward". gnn.gov.uk. 16 November 2006. Archived from the original on 28 July 2007. ^ Seager, Ashley (17 November 2006). "Union fury over tax office cuts | Business | The Guardian". London: Politics.guardian.co.uk. Retrieved 21 June 2009. ^ Reed, Kevin (16 November 2006). "HMRC senior staff concerned over further job cuts". Accountancy Age. Retrieved 21 June 2009. ^ "Morale among HMRC workers falls to new low". Accountancy Age. 9 July 2009. Retrieved 9 July 2009. ^ "Tax system overhaul as real-time operation is tested". BBC News. 11 April 2012. Retrieved 31 March 2013. ^ Power, Rachael (2 January 2015). "Revenue Scotland ready to replace HMRC for devolved taxes". Retrieved 20 September 2016. ^ "HMRC reveals tax office shake-up". BBC News. 12 November 2015. Retrieved 12 November 2015. ^ "List of proposed HMRC office closures". BBC News. 12 November 2015. Retrieved 13 November 2015. ^ "David Gauke". HM Government. Retrieved 18 May 2015. ^ "HMRC chief executive to quit post". BBC News. 11 January 2016. Retrieved 25 February 2016. ^ "HMRC: Government names new bosses at tax authority". BBC News. 24 February 2016. Retrieved 25 February 2016. ^ "HM Revenue & Customs:Non-Executive Board members". Hmrc.gov.uk. 28 June 2011. Retrieved 18 January 2013. ^ "Explanatory note on HMRC salaries and organisation charts." Government of the United Kingdom. Retrieved 1 February 2017. ^ "Powers and safeguards." HM Revenue & Customs. Retrieved 1 February 2017. ^ "Measuring tax gaps 2016 edition" (PDF). ^ "HM Revenue and Customs 2008–09 Accounts: The Comptroller and Auditor General's Standard Report – National Audit Office (NAO)". National Audit Office. ^ "HM Revenue and Customs 2008–09 Accounts: The Comptroller and Auditor General's Standard Report". Nao.org.uk. 20 July 2009. Retrieved 27 February 2012. ^ a b "Darling admits 25m records lost". BBC News. 20 November 2007. Retrieved 20 November 2007. ^ "Inland Revenue dumps IT provider". BBC News. 11 December 2003. Retrieved 4 May 2010. ^ "EDS pays for tax failure". theregister.co.uk. ^ Rebecca Thomas. "Taxation | Solutions | Capgemini UK". Uk.capgemini.com. Archived from the original on 20 November 2010. Retrieved 27 February 2012. ^ "HMRC renews Aspire deal to save £110m". Computerweekly.com. 30 October 2009. Retrieved 27 February 2012. ^ Tony Hazell. "Taxman hid truth about code chaos". London: Dailymail.co.uk. Retrieved 27 February 2012. ^ "HMRC benefits as new PAYE system issues wrong tax codes". ^ "BBC News – HMRC staff sacked over race abuse". 18 August 2010. Retrieved 18 August 2010. ^ "Tax chief won't rule out using terror laws again on whistleblowers three years after HMRC sparked fury by targeting staff member who revealed Goldman Sachs deal". Daily Mail. London. 25 March 2014. ^ Rajeev Syal. "HMRC's use of powers against whistleblower 'indefensible', say MPs". The Guardian. ^ "Effectiveness of tax reliefs, improving tax collection: reports published". UK Parliament. ^ "HMRC defends call waiting times of 47 minutes". BBC News. ^ "The quality of service for personal taxpayers" (PDF). National Audit Office.